Eurostar has confirmed that its long-delayed service to Rotterdam and Amsterdam will begin on 4th April. There will be two trains per day from London St Pancras, leaving at 8.31am and 5.31pm. It will take 3 hours 1 minute to Rotterdam and 3 hours 41 minutes to Amsterdam. The big problem comes on the return. It will take another year, perhaps more, to get full UK passport and immigration services installed in Amsterdam and Rotterdam. Until then, you will be able to board trains without any checks. ALL passengers will have to get off the train in Brussels which will carry on (either empty or with passengers ticketed from Brussels) to London. They will be booked onto a later London train to allow time for full passport formalities – a process which could take a long time given the number of passengers involved. You will have the option of being booked on a Thalys / Eurostar combination which, because of how the timetable works, is actually quicker albeit still over four and a half hours. If you want to try this new route, the HFP article explains how to use your Amex Membership Rewards points for Eurostar tickets. 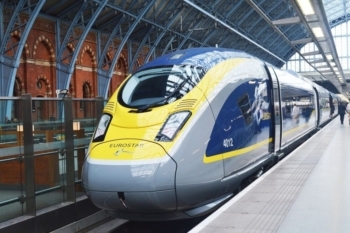 Remember that free Eurostar tickets really are free – there are no taxes or charges to pay. Tickets will go on sale on 20th February. Prices will start at just £35 one-way as Eurostar attempts to use price to woo customers from the airlines and fill the early services. Remember that American Express Platinum cardholders get free access to Eurostar lounges. You cannot bring a guest but your partner is likely to have a supplementary Amex Platinum card anyway. It’s half-term (at least, it is in our house). If you are planning to take the kids on a train trip, it is worth noting that Friends & Family Railcards can now be bought and downloaded instantly as can most other Railcards. During the purchase process on the Friends & Family Railcard website you have the option of selecting a Plastic or Digital railcard. If you choose Digital, you are emailed a code after purchase which you type into the Railcard app on your phone. The Railcard can be added to two phones if necessary. This allows you to buy a Railcard and buy discounted tickets immediately without having to wait 5 days for a Plastic card to arrive. As a reminder, a Friends & Family Railcard gets you 33% off Standard Anytime, Off-Peak and Advance adult fares and 60% off for kids’ fares. Restrictions apply on times of travel and which trains are included. First Class travel is not included. Gatwick Express, Stansted Express, Heathrow Express and Heathrow Connect services ARE included – we got 4 x one-way tickets on Gatwick Express for today for £30.20 using a Railcard. The Friends & Family Railcard website here has more details. Do you know if you can split the journey in Brussels? – eg spending a few hours/days there before then taking the Eurostar back to the UK? I’ve checked the Eurostar website and the outbound journey is far too long at well over four hours. I don’t care about the price either. No can do. When the Eurostar reaches 88 miles an hour in the channel, a flux capacitor makes the whole train and its contents leap one hour into the future. The process is reversed when returning. Planes do the same thing but over the channel rather than under it. They haven’t gone on sale yet, you probably are seeing the trains times with a stopover in Brussels. The time is 3hours 41 mins which is competitive with flying in my opinion… shame about the return journey and lack of a direct train.. I wonder how much that will impact bookings. I will be booking as soon as they go on sale for July but my return journey will be by plane.. Surely getting from london to LHR/LGW, checking in an hour before and then schiphol to centraal means most flights take at least 3-4 hours anyway (knock off a bit for LCY). Add in the restrictions you have on baggage and liquids etc. Personally if pancreas is near by/easy to get to this doesn’t seem bad at all. will the train stop in Antwerp? Train stops in Brussels and Rotterdam, tickets on sale from 22nd Feb…. first freebie press trip was today 20 th feb.